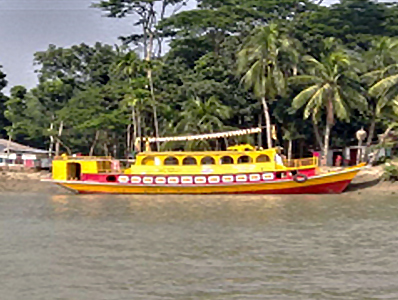 SMC’s Floating IEC Center is one of the important innovative activities under the “Notun Din” community mobilization program of the USAID-funded Marketing Innovations for Sustainable Health Development program. SMC has been implementing this program since 2010 at hard to reach riverine areas. This centre has already generated huge interest among the audience of community in southern part of Bangladesh. The centre reaches the pre-scheduled harbor of the riverine areas as part of its daily activities. People get into the launch after registration and sit in the gallery followed by 4 video drama shows on HTSP (drama name - Notun Diner Golpo), first 1,000 days (drama name - Jotno Nile Rotno Mile), Adolescent Health (drama name - Notun Diner Ovijan) and TB (drama name - Rongila Bao). Four video dramas are played to disseminate information on family planning, maternal and child health (MCH), adolescent health, nutrition and TB. After the video, shows quiz sessions were being carried out and several IEC/BCC messages. Promotional materials containing important messages are also being distributed among the participants. 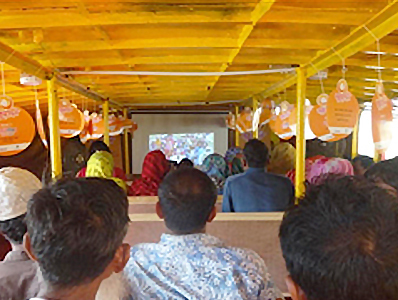 The centre is conducting shows in the intervention upazilas of Pirojpur, Jhalokathi, Barishal, Madaripur and Faridpur districts.